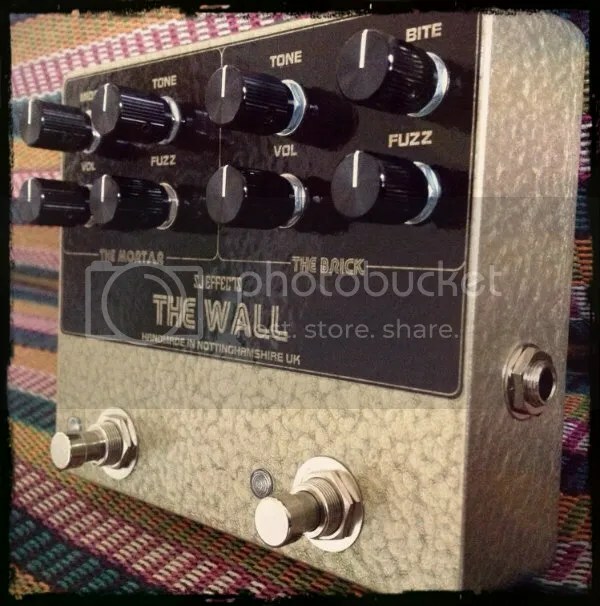 The Wall (Big Muff + Bass Fuzz). After a nice break over Christmas and New Year I am kicking of 2013 with another custom build. This is a 2-in-1 fuzz pedal for a cool guy from Perth, Australia. Its a Woolly Mammoth-alike circuit (built on a Madbean Sabretooth PCB) going into a Hoof-alike Muff (built on one of my new Tesla Cannon V2 PCB’s). 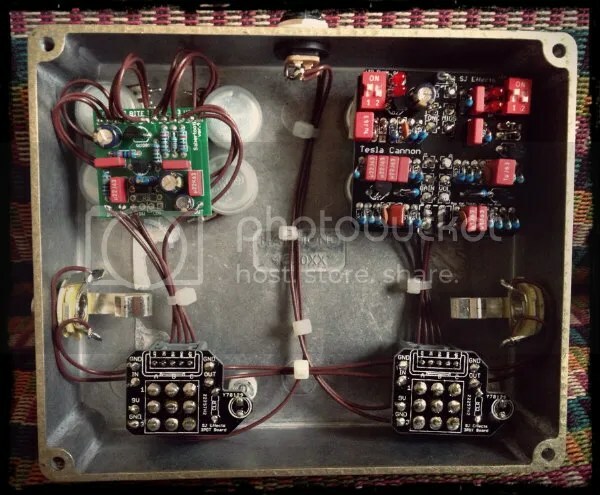 I tested the Muff circuit side by side with my own EQD Hoof and it sounds pretty much indentical to my ears (other than there being a bit more gain on tap on the Tesla Cannon). The PCB allows you to switch between LED or 1N4148 diodes for each clipping stage with the DIP switches. You could also choose no clipping on either stage if you wished to as well, which would produce cool jumbo tonebender tones. There is also a mids control on the Muff, that lets you go from traditional ‘scooped’ mids, to boosted mids. This makes the circuit a lot more versatile than a traditional Bif Muff, and helps to ‘cut through’ a band mix. The customer chose the pedal and circuit names: ‘The Wall’ comprising of ‘Brick’ and ‘Mortar’. He is a White Stripes and Black Keys fan, so I think he should dig the tones this thing produces. The Wall. Gutshot! 2-in-1 Fuzz Pedal. 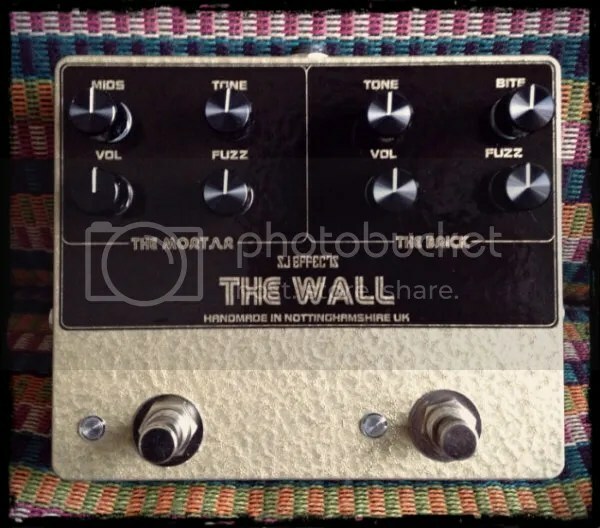 This entry was posted in Uncategorized and tagged 2-in-1 guitar pedal, big muff, big muff mids, custom big muff, custom effects, custom guitar pedals, fuzz, hoof, woolly mammoth by sjeffects. Bookmark the permalink. Bass fuzz coupled with muff, seems an interesting combo.